June 1st has arrived and it is now definitely "the season." No, I am not talking about the time for debutante balls in London for the well-to-do families of the nineteenth century. 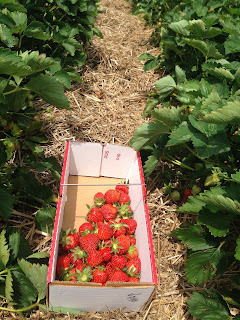 It is time for all things local food, including, but not limited to, strawberries, asparagus, greens, farm visits, CSAs, and lots of farmers markets. 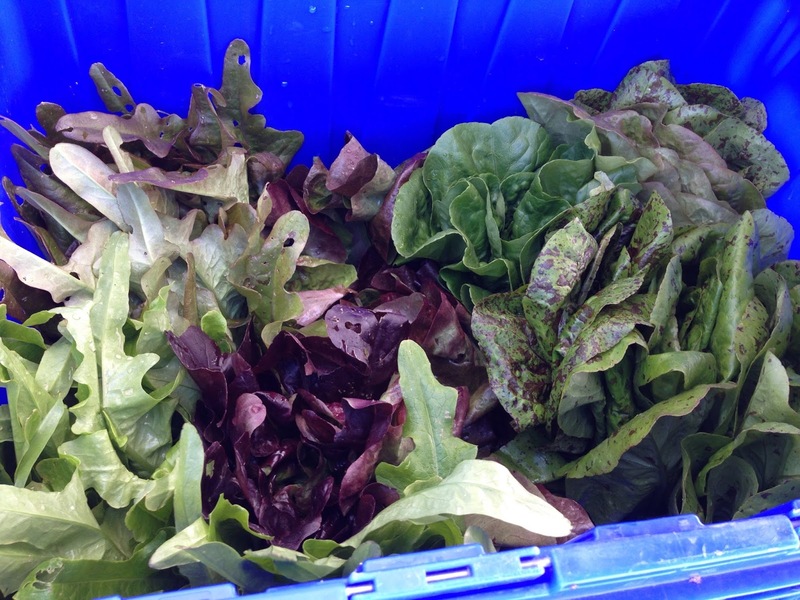 We picked up our first Community Supported Agriculture (CSA) yesterday from Dillner Family Farm. 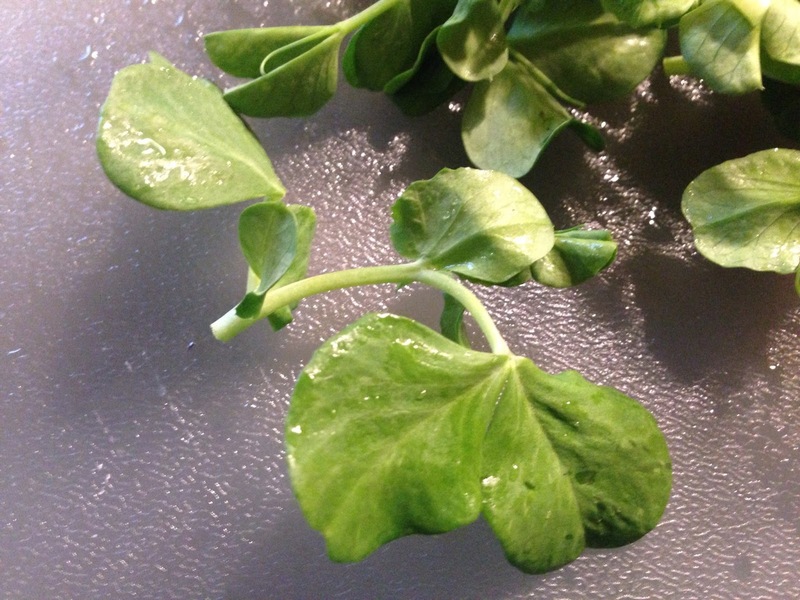 I've linked to the page on the site that lists the items that were in the first CSA share. The good news is, Dillner still has CSA shares available. So do lots of farms, such as Edible Earth Farm, Kretschmann Farm, Brenckles Organic Farm, Who Cooks for You Farm, Harvest Valley Farms, and Clarion River Organics. Some of these have not started delivery yet, so you won't have missed a thing. 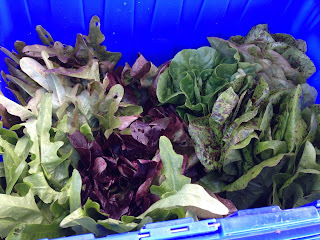 Check out this CSA guide to see what farm might have a drop-off location near you. The guide is not entirely complete or correct, FYI. CSAs just make everything easier. You don't have to think as much or make extra decisions, which we all know is stressful. You get the delicious food automatically (well, kind of -- you just have to remember to pick it up and unload it from your car or bike) and then you can use it as you wish. And, you get to support a local farm, farmland, farmer, and farmer's family. It's so great to have a relationship with a farm and farmer. Usually subscribers can visit their CSA farm and many farms will communicate with subscribers via an e-mailed newsletter. What are you waiting for? In our first CSA yesterday, we got asparagus and a zucchini, both of which are already gone. We also got red onions with their greens, green garlic, greenhouse tomatoes, spinach, a loaf of bread, a dozen eggs, and a parsley plant. The spinach, some garlic, some onion greens, and four eggs are baking in the oven in a quiche right now. We will probably just eat the tomatoes with salt and pepper along side it. And, my kids are taking care of the bread pretty quickly. So, as you can see, a day has passed, and we are almost out of fresh produce. That's where farmers markets (a market where many farmers come together at a certain day, place, and time to sell produce they have grown) and farm markets (these are located at a farm, where that particular farm sells whatever it wants, but often sells produce it grows or gets from local farms) come in handy. Many farmers markets have opened this week. Today Farmers at Phipps and Mt. Lebanon have opened as well as the Garfield Farm market. The link is on the side of the blog also, but I really like this listing by day of which markets are on which days by Good Food Pittsburgh. 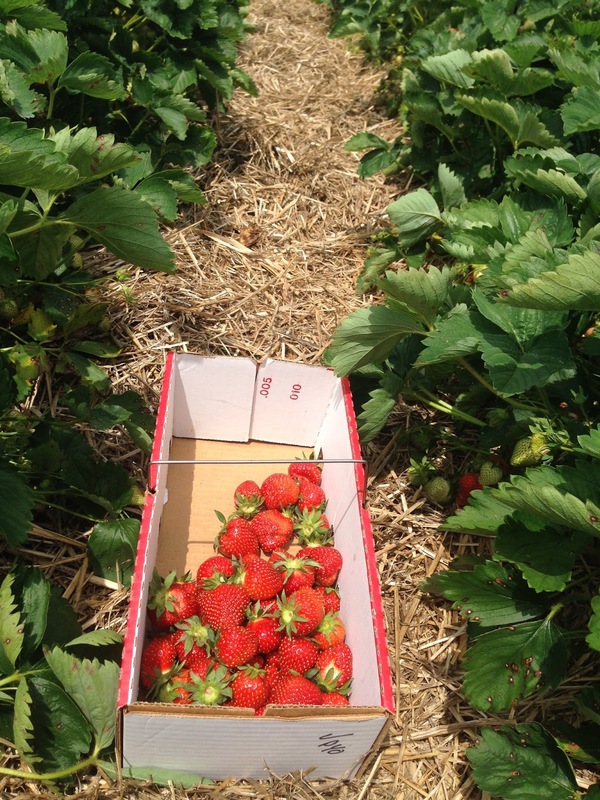 And, if you go to a farmers market in the next few days, you will probably see strawberries! If you read this and you get a CSA, please share which one it is and anything about it that you feel would be helpful to know. Thanks! You know Atalanta who was so fast she never lost a race? And the potential suitors who did not beat her in a race would be killed? Until one guy (I forget who), tricked her by lobbing golden apples in her path? It was all Aphrodite's idea, anyway; he certainly didn't think of it. I kind of had that experience yesterday. Well, not really, but I was chasing golden beets and was distracted by them. I was at the East Liberty Farmers Market and had a plan in my head of exactly what to get to make dinner for the next two days. Sometimes, though, good intentions and too much planning get in the way of taking advantage of what is available right now! I saw the beautiful golden beets at the Harvest Valley Farms stand. I looked at them longingly; I asked if there would still be beets in two weeks (because there is no market next week for Memorial Day), and the answer was, "probably." Since it was not part of my plan, I didn't buy them. But then I could not stop thinking of them the rest of the night and next morning. A little side note on tastes -- If I had told myself three years ago that I would be longing for beets, I probably would have thought future me had lost her mind. My tastes have expanded and diversified a lot in the past years. My children who are very picky and eat next to nothing besides pasta, crackers and junk food, like to remind me of how much pickier I used to be even four years ago. I would not even consider eating fish then. It was strictly a no touch, no see, no smell situation. Same for beets. I still cannot bring myself to eat "regular" beets. I puree those to add to chocolate cupcakes. But more on that later. I discovered golden beets somehow, and I now have a favorite way to eat them. Golden beets taste much better than red/ purple beets. They are much more fruity, less earthy, more mild. So, I had other errands to run in the vicinity of way up Route 8, so after calling to confirm that the Harvest Valley Farms Market and Bakery had some golden beets, I headed out. It's nice to have a farm market near you. This particular one isn't really _near_ me, but anyway, I imagine it would be nice. The parking lot was super full, but they had golden beets -- two bunches left. They also had all sorts of other delightful fresh vegetables from their farm including asparagus. They said perhaps they would have strawberries next Tuesday (May 31)! 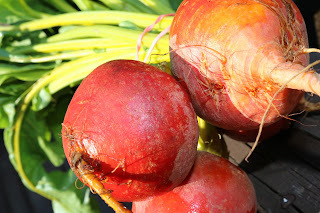 So I bought the beets and some other things too and eventually after many other errands, headed home to make (after many chores) my favorite recipe using beets. The following recipe is a combination of many different ones I have seen, including this one, this one, and this one. Preheat oven to 400 degrees. Scrub beets and trim the ends. Do not peel. Wrap each beet in foil and place them all on a cookie sheet. Cook for 20 minutes (golf ball size) to 60 minutes (tennis ball size), depending on size. My medium-sized beets cooked in 40 minutes. 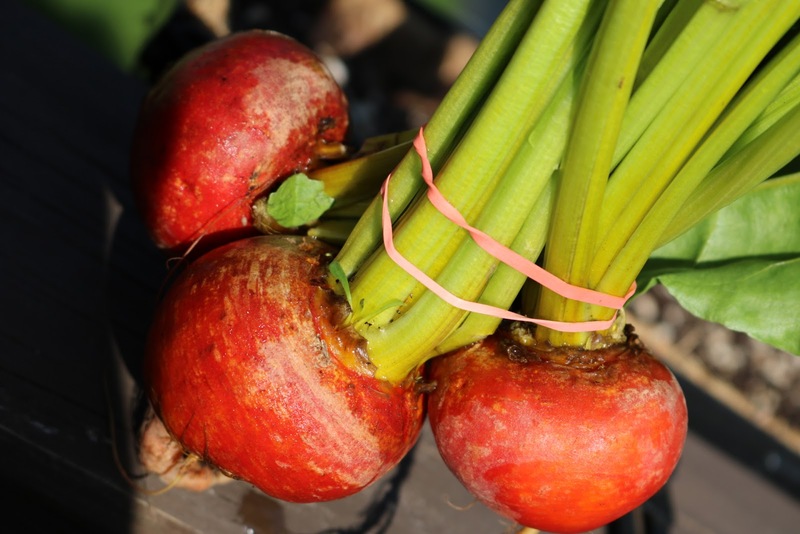 When beets can be pierced easily with a fork (but they should NOT be soft or mushy), remove them from the oven and open up the foil to let them begin to cool. Once the beets are cool enough to touch, rub the outsides of the beets with your fingers to peel them. The peel will fall right off. Chop the beets into 1 inch squares (or so). While the beets are cooking make the dressing in a large bowl or spouted cup (I use a two cup measuring cup), by whisking all of the ingredients except the olive oil together. When the salad is put together and ready to serve, slowly whisk in the olive oil so that it emulsifies. Rinse the scallops and pat them dry with a paper towel. Add salt and pepper to scallops. Heat oil in a large skillet over medium high heat. Carefully add the scallops so they have their own space. Cook the scallops about three minutes per side -- until they are opaque. Remove them from the heat. Put together the salads by starting with the greens, adding one chopped beet per salad, 1/2 peach per salad, 1/8 c. goat cheese per salad, and then topping with whole scallops (each salad should have three to four). 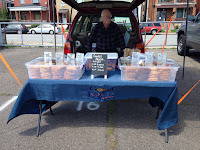 Here I am again, singing the praises of the East Liberty Farmers Market, run by Citiparks at Station Street and North Euclid on Mondays from 3:00 to 7:00 PM. It's already open, and it will run through November 14. It will probably be closed on Memorial Day, but you can go tomorrow! One cool thing about some of the farmers markets around Pittsburgh, is that Just Harvest is there with tokens as part of its Fresh Access program, which are accepted at many of the vendors, just not the hot food vendors. For those who forget to bring cash, tokens can be purchased with a debit or credit card, and then are accepted at the vendors just like cash -- except they only come in $1.00 and $ .50 denominations. The tokens never expire and can be used at 17 different farmers markets. For those who receive food stamps, the access card can be used to purchase tokens. With every $5.00 purchase, $2.00 in food bucks coupons to spend on fruits and veggies are included. 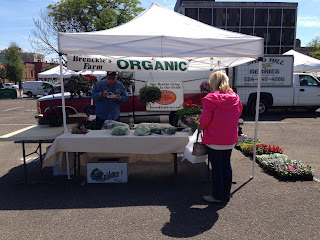 I poked around a little on the web, and I didn't see a list of vendors at the market. In case you want to know what to expect, I'd like to provide you with a list of vendors here. I may have forgotten someone, and most likely, more will be added as the season progresses. With the prepared food tables, I will let you know what I have learned about their use of local products. Sells prepared mediterranean-style foods that seem very popular, fresh-baked pita bread, and fresh squeezed lemonade. No local sourced products as far as the vendor and I could figure out. Kettle corn that is popped right in front of you. Kettle corn is a little sweet if you didn't know. They also sell chocolate kettle corn until June, then they switch over to cheddar, because it is less likely to melt. I can't imagine it being warm enough to melt chocolate right now, so I guess we'll have to see. Again, nothing locally sourced. These folks are from Monogahela, PA. He is always happy to talk about his honey, what kind it is (wildflower? spring bloom? golden rod? ), its flavor, when it was bottled, and more. He offers many different sizes as well as raw honey, honey comb, etc. We have a 5lb. jug that my kids drink from. Well, not exactly, but sort of. I know there are a lot of bee enthusiasts around here, but he can definitely be counted on for a wide variety of a very, very good product. Even though these are not locally sourced, my kids have been eating and loving these for years. I have to admit that I enjoy the ginger "snap" cookie every once in a while. It is not a snap, though, but is instead chewy, just as it should be. 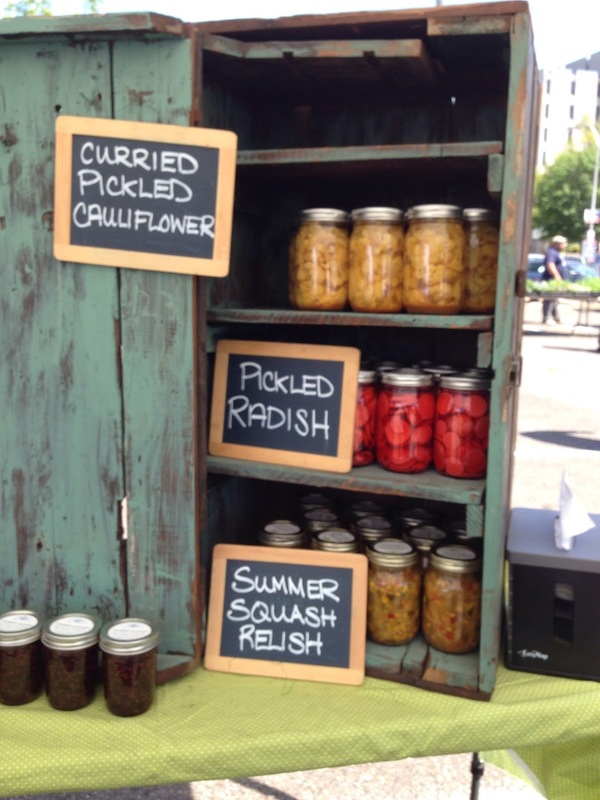 Chef Greg Andrews is the "pickled chef" and this for sure is a locally sourced vendor. 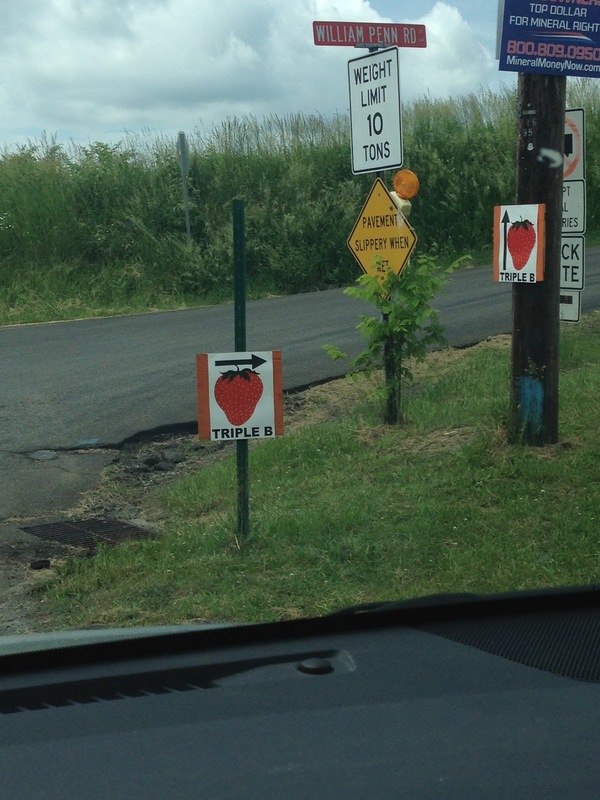 They run a farm to table restaurant in Greensburg called The Supper Club. It looks pretty awesome to me. They currently have pickled asparagus, ramps, green garlic, and garlic scapes from this season. 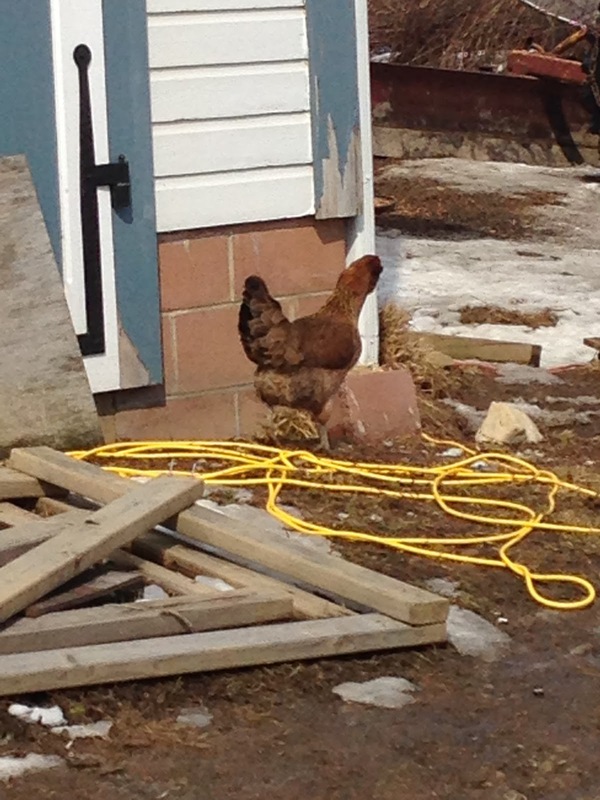 They work with a number of local farms, but one of the chief ones recently is Let it Grow Farms in Scotdale. They also use Zeke's Coffee in their Espresso Bar B Q sauce and Natrona root beer in their Root Beer Bar B Q sauce. In addition to the many sauces, and lots of other pickled vegetables, they carry several fermented foods, such as kim chee, sriracha, sour dill pickles, and sauerkraut. As soon as locally farmed fruits and vegetables become available, they will use and sell them. 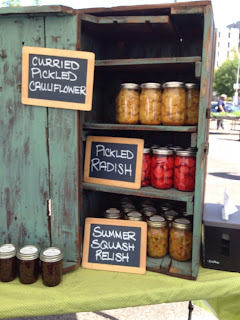 If you like pickled and fermented foods, you should definitely pay them a visit. This is an organic farmer who used to sell at the Farmers@ Firehouse market in the strip district. I have had a lot of their produce and it is for sure excellent. I picked up some spinach from them on Monday and it was lovely. As you may be able to see from the picture, they had flats of annuals and hanging plants as well. This is a family farm, and the farmer I met has been running the farm for too many years to count. He has quite a sense of humor. I hope you will stop by to pay him/ them a visit. 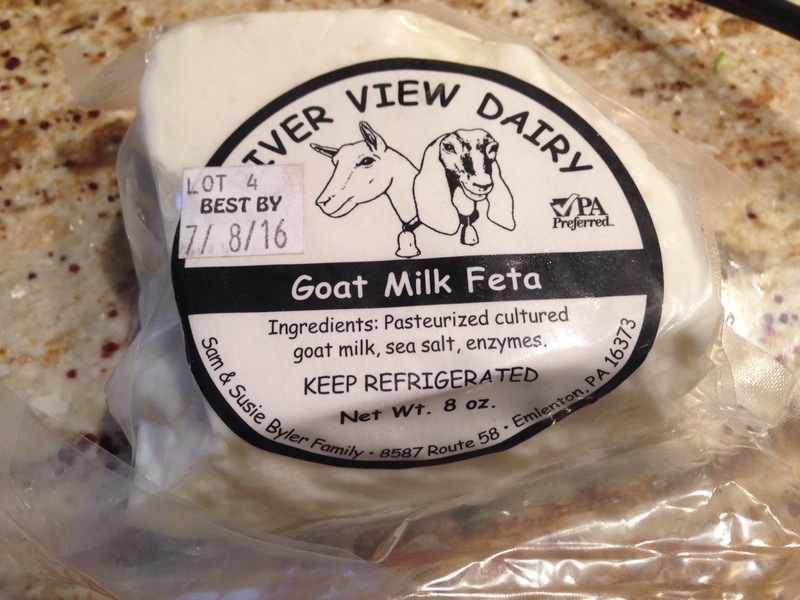 Carries lots of local cheeses, milk, ice cream, and yogurt, all from local dairy farms and/ or locally made. I've purchased two cheeses so far, the goat milk feta from River View Dairy and the Royer Mountain from Clover Creek Cheese Cellar. Their products can be found at Market Street Grocery, and for those lucky enough to have a Harvest Valley Farms, Clarion River Organics, or Who Cooks for You Farm CSA, a cheese subscription is a choice to add on. Pies, fruit ties, bars, brownies, crisps, cookies, cinnamon rolls, and pepperoni rolls from Bethel Park. They are new to the East Liberty Farmers Market this year. They may use local farms for fruit as it becomes available. This is a high quality bakery based out of Robinson, PA with lots and lots of choices for bread. It is locally made and they source their rye from Washington County. They often sell muffins, scones, and/ or some other type of bakery treats along with the bread. I'm afraid I can't tell you too much about this stand/ truck. I'll get back to it when I bring my fifteen year old meat-lovin son. Nothing I've seen seems to indicate that anything is locally sourced. This an Ohio farm that usually sells a lot of fruit and corn in addition to other vegetables. 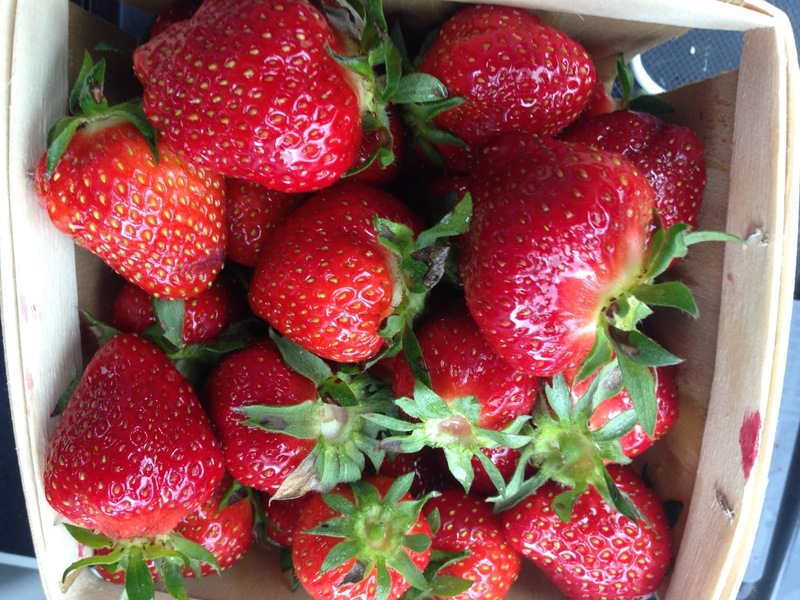 In fact, last Monday they had a few cartons of strawberries! I got there right behind the woman who got the last pint. I will not be missing out on those this week. They often have lots of peaches during peach season. And their apples are great. On Monday I bought Fuji apples from them which were still crisp and juicy. They are a pretty large operation as far as I can tell and go to farmers markets all over Ohio in addition to Peters Township, Market Square, and Bloomfield around here. I wrote about these folks a couple of weeks ago. They sell frozen and smoked trout as well as frozen beef, pork, and goat. We have bought two types of pork sausage from them and have really enjoyed both types. Their rainbow trout was AMAZING! It was caught and frozen the day we bought it. I bought a filet, brought it home, thawed it in cool water, and grilled it with olive oil, garlic, rosemary, salt and pepper. It was soooo good. I am only recently a fish eater, and I only like fresh fish that is not "fishy." When I opened the package, it smelled like. . . nothing. But it tasted like like all it should have. This is my go to vendor. Art King and his family, located in Valencia, farm sustainably and are active members of PASA (Pennsylvania Association for Sustainable Agriculture). We have gotten the HVF CSA for years and have always loved it. Their vegetables are high quality every time. I have written about them on this blog many times. This week I got green onions, beautiful greenhouse grown little tomatoes from Yarnick's Farm (which were so good -- I just ate them out of hand) and a lovely, delicate, and so tasty spring mix. These Harrison City farmers have been regulars at the East Liberty Farmers Market for years. They can always be counted on for a good selection of tasty vegetables and fruit. Another long-time vendor in East Liberty. They grow their own berries, many, many kinds, that they sell at their stand. They even have frozen berries available year round. However, I think they are most known for the pies, sauces, jams, and jellies, which are top-of-the-line. is an organic farm that carries many specialty vegetables. Their eggs are always great, and I often get ours from him. He also has many, many varieties of garlic, so if you are a garlic nut (like many of us are), you should plan to visit him later in the summer. Lettuce varieties galore, kale, greens, and other heirlooms tend to populate his coolers and counters. Come here for the vegetables you love, but in a slightly different, more interesting form because he will usually offer multiple varieties that you won't find elsewhere. is a very popular stand at the market. They give out samples, which I think helps. Also, it seems that lots of folks like smoked meats. Billy's gets their meats from local distributers and then create their products. They have the following smoked products: kolbassi, bacon, hot dogs, pepper sticks, summer sausage, salmon, and steak jerky. They also have fresh sausage. I don't believe the meat is sourced locally. They only know which distributors they use. was formerly known as Ohio City Pasta. They sell fresh/ frozen ravioli and fresh pasta as well as gnocchi by special order. They say they source their ingredients locally. We purchased gnocchi last week. It cooked a little too fast for me! I accidentally let it turn into goo. Let that be a warning for you if you try it. Cook for only two minutes, is my guess. has delicious salsas and chips that you can sample. I did not get a chance to quiz them about sources (I am a pain about it, believe me), but I can promise we have had their salsa and chips before and they are great. is the famous biscotti company in the Strip District. I don't think anything is locally sourced, but they are a Pittsburgh institution. They also have cookies and bread in addition to many flavors of biscotti. sells mostly vegan (except for honey in some products) hummus and greens and grains salads. I purchased the veggie hummus and it was mildly flavored but delicious. They will be using local ingredients as soon as they are able. They are in many farmers markets around the area, so I hope you get a chance to stop by and try some samples to discern what you like. anchors the base of the farmers market and offers lots and lots of produce in addition to flowers. I haven't ever been able to find out too much about them and their growing practices and after some disappointments with their products years ago, I am not a regular patron. 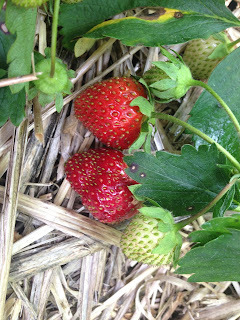 is a certified naturally grown farm in Armstrong County. They had tons and tons of seedling for May Market, some of which are growing in planters on my porch right now. They offer the vegetables you are probably used to seeing as well as some you may not have seen. I tasted ground cherries there for the first time, for example. Last week, they had nettle (along with seedlings and lettuce and green onions), which needs to be cooked just a bit because it has thorns. Please write in if you have anything to add about any of these vendors. Be sure to make it to the market on Monday. Earlier this week I wrote about Weatherbury Farm. 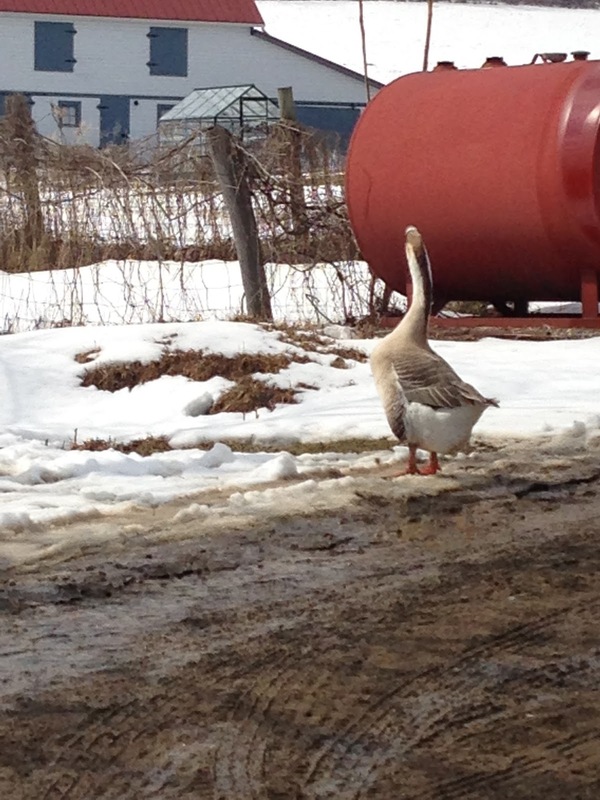 We just missed a grain pickup at Weatherbury Farm, but luckily, another one is coming up soon! Place an order using this order form and price list by Saturday, May 28 because all of the organic grain is ground to order. Pickup is at the farm in Avella (link to directions) on June 3 from 5:00 PM - 6:15 PM and Saturday, June 4, from 11:00 AM to 2:00 PM. Organic, free-range eggs are also available by the dozen, which you can pick up with the grain. They only cost $3.50 for a dozen! What a steal! If you live in the area, or are just really desperate for eggs, you can email them, and they will set them aside for you any ole' day. If you pick up on June 3, you can stay for a potluck dinner and folk music jam, which starts at 6:15! No admission is charged, but they ask that you bring a dish to share. Sounds like fun. I'd love to hear from anyone who uses Weatherbury's grains/ flour/ beans or anyone planning to go to the music jam. And, did I mention that they are organic? 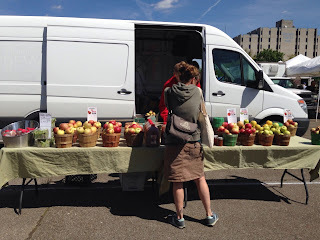 Monday was a great day to visit the East Liberty Farmers Market. I got a lot of delicious items, and I will be writing all about the different vendors who were there in a post coming soon. 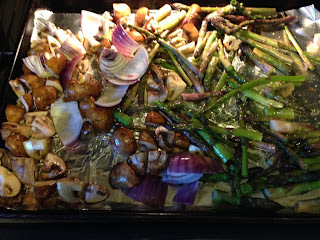 Because it was there, I bought two batches of asparagus from Harvest Valley Farms. 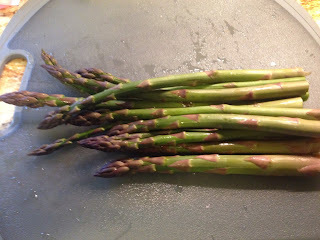 I love local, fresh asparagus, and you should too. 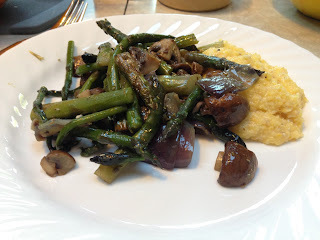 Last night we had a delicious dinner with roasted asparagus over polenta. Roasted asparagus tastes good with anything, but since we have some great organic local cornmeal from Weatherbury Farm, that is what I used. 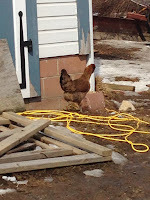 Some photos of the farm are below. 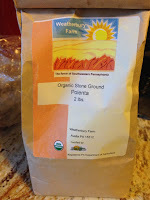 Weatherbury Farm started growing, milling, and selling their own grains quite a few years back. 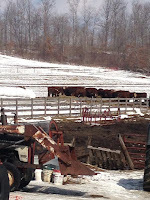 Back in April of 2008, I wrote a blog post about beef and farm stays at Weatherbury Farm. At that time, their grains were not available. Now, grains are a big part of their business. 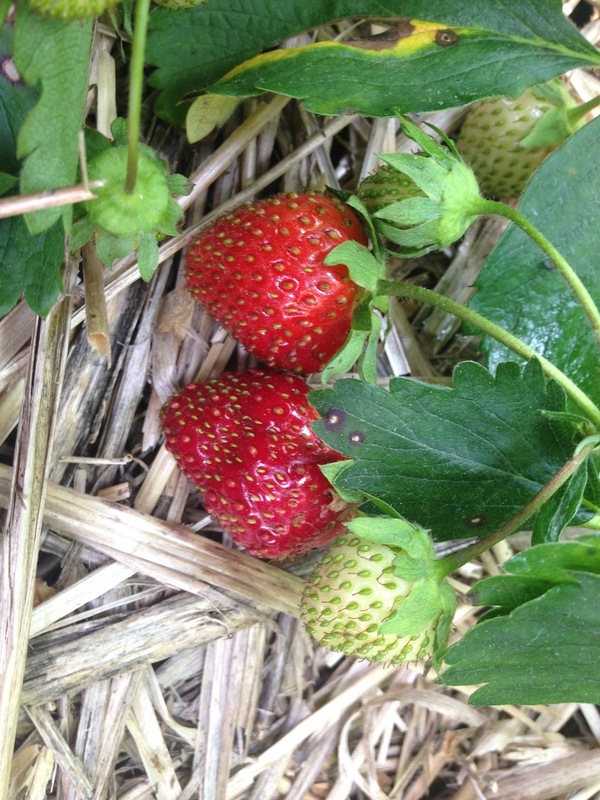 They are all certified organic, grown on their farm, and milled on their property with a mill certified by the Pennsylvania Department of Agriculture. All of the following products are stone ground. They grow Maxine Hard Winter Wheat, which is used for whole wheat bread flour and unbleached bread flour, Frederick Soft White Winter Wheat (available in August 2016), which is used for whole wheat cake and pastry flour and unbleached cake and pastry flour, Aroostook Rye, for whole rye flour and light rye flour, Oberkulmer Spelt, for whole spelt flour and unbleached spelt flour, Wapsie Valley Open Pollinated Corn, for open pollinated polenta (more coarse) and open pollinated cornmeal (more refined), buckwheat flour, and rolled oats. They also grow black turtle beans, and those will be available in November 2016. Some other grains they are working on are einkorn, emmer, and Hull-less oats. We just missed a grain pickup; it was Saturday, May 14. Customers need to order from Weatherbury Farm (link to the order form) about a week in advance because they mill to order. 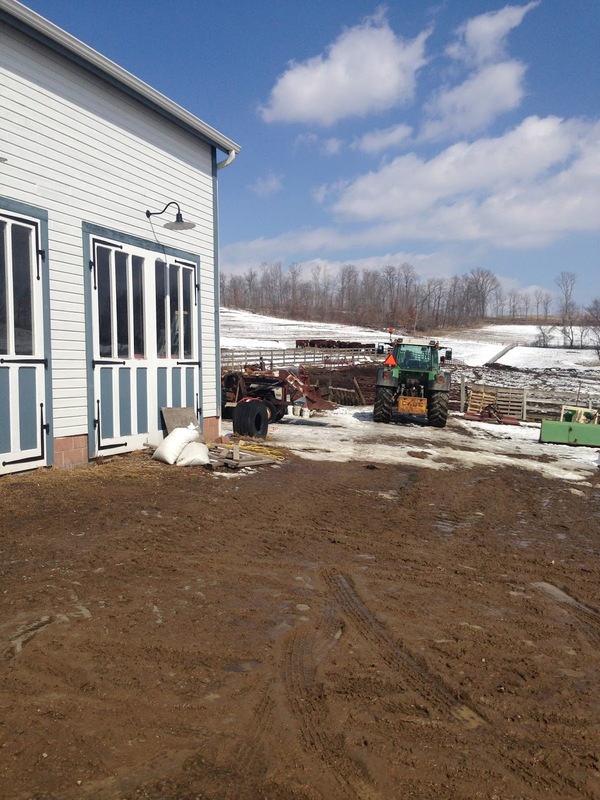 Then you drive to their farm in Avella, PA to pick up your order. They have a Facebook site, FYI. Weatherbury Farm grains can also be purchased at the Market Street Grocery in downtown Pittsburgh. Currently they have cornmeal and buckwheat. Or, a greater variety of the Weatherbury Farm grain products are available through the Penn's Corner Farm Alliance Farm Stand. You can place an order through an app or online by May 19 and then pick it up next week. This pattern repeats each week, actually. Multiple location are available for pick up (Monroeville, Squirrel Hill, Lawrenceville, Homewood, or Northside, etc.) or one can get home delivery (in the Pittsburgh area) for an order over $50 for a $15 fee. I will definitely have a blog about Penn's Corner at some point. 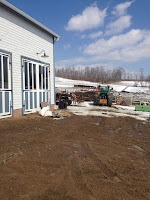 The farm itself also sells grass-fed, sustainably organic freezer beef and lamb. 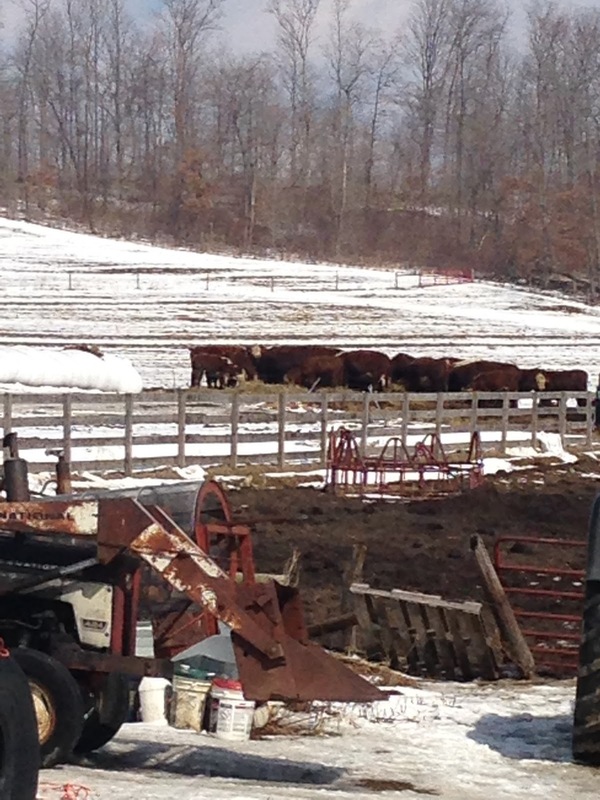 Customers can order beef now in the form of 1/4 or 1/2 cow to be picked up in August and/ or December of 2016. There is also a waiting list for lamb. Last year I was lucky enough to purchase 10 pounds of whole cow hamburger. I wish I had purchased 20! It was fantastic and so convenient. I purchased the oats, polenta, and turtle beans about a year ago also. As soon as I brought them home, I placed all of my bags in the refrigerator. The only one left is the polenta. It is still very good, actually. As I said, I made polenta last night to go with roasted asparagus, onion, and mushrooms. The recipe heavily borrowed from this one. 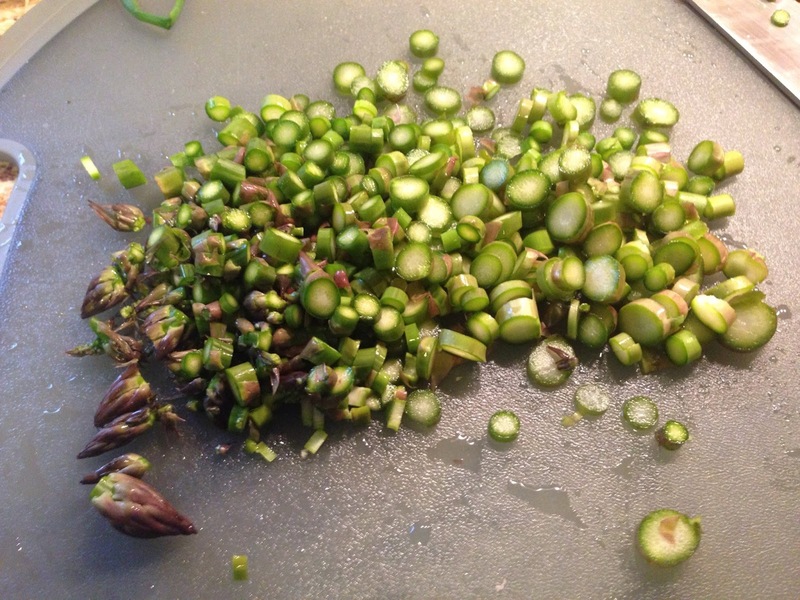 After cutting off tough ends, chop asparagus into 2 inch pieces. Quarter the baby bellas, 1/4 the 1/2 of the red onion. Spray the vegetables with an oil mister (or drizzle with oil), sprinkle with salt and toss. Place on a foil-lined baking sheet. 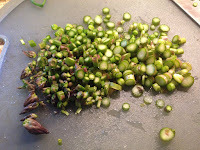 If your asparagus is different thicknesses (as mine was) leave the thin stalks out for now. Put in the oven once it is preheated. Set timer for 5 minutes. Bring 3 cups of water and 1/2 tsp salt to a boil. When it is boiling, add the polenta in a slowish, steady stream while stirring (so no lumps are created). Turn down the heat so that the polenta is at a low boil or vigorous simmer. Set the timer for 10 minutes. At this point, your timer should have gone off, so turn your baking sheet, stir the vegetables, add the thinner asparagus, and reset the timer for five more minutes, which will be enough time to bring out the sweet flavors of the vegetables without making them too soft. Adjust timing as needed for your own oven, of course. Stir the polenta as often as you can otherwise it sticks to the bottom of the pan and burns. You may need to add up to 1 cup of additional water if the polenta sticks too much or seems too dry. When the vegetables are done, remove them from the oven and move them to a bowl. Toss them with the rosemary, oregano, and thyme. Or serve on a platter and sprinkle with herbs. 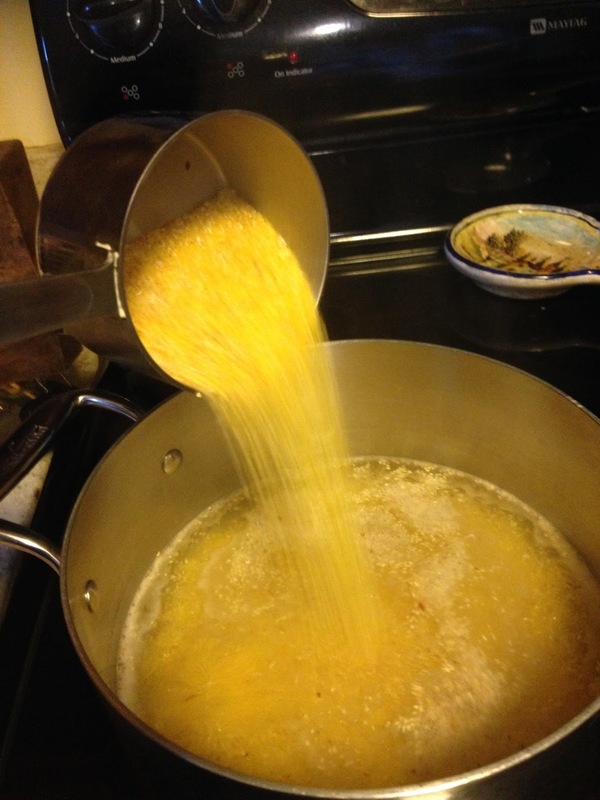 Once the polenta has absorbed all of the water, remove from heat. Stir in shredded cheese, and add pepper if you wish. I used to purchase local mushrooms from Mushrooms for Life at the Farmers@Firehouse market in the Strip District. Sadly, the market is no longer open. Boo hoo. I'm not sure if he will pop up anywhere this season. In the meantime, you can get local mushrooms at the East End Food Coop. Furthermore, if you are looking for additional recipes with polenta, in today's Pittsburgh Post-Gazette a feature was written about George Washington's recreated grist mill at Mount Vernon. Interesting recipes using grits, which I believe are interchangeable with polenta, appear in the article. There is one for shrimp and grits, which I have made many times and is delicious, and peach and grits parfait, which I may try during peach season. What grains do you use from local grain suppliers? How do you like to prepare polenta/ grits? Or asparagus? With fresh asparagus in hand, it was time to make some raw asparagus salad. I actually had no idea that one could eat asparagus raw until last year when I purchased it at the Farmers at Firehouse Market (that is, alas, closed as of this year) and Susan Barclay of Slow Food Pittsburgh was demonstrating a wonderful concoction that she shared via this recipe. She cautioned that raw asparagus is only tasty if it is fresh, as in picked that day or maybe the day before. So, now is your chance to eat something which you normally cannot! And, believe me, it is a treat. The taste of the raw asparagus is subtle, juicy, crispy, wonderful. 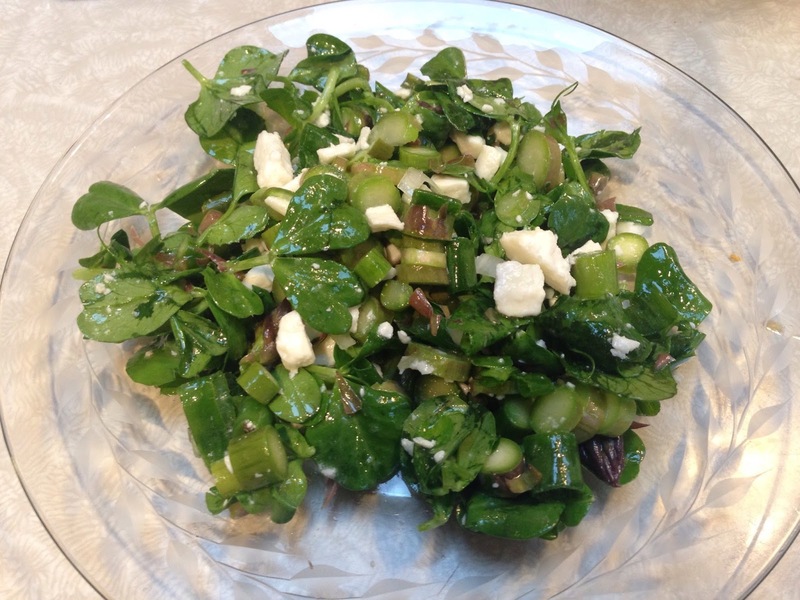 The salad she made uses many of the fresh spring ingredients available: rhubarb, honey, asparagus, pea shoots, and chives, for example. Rhubarb and I are not best friends, actually, so instead I made my own version with the spring things I purchased at the Citiparks East Liberty Farmers Market on Monday. There are lots of recipes available for using asparagus, raw or cooked. What's your favorite asparagus recipe? Please share in the comments!